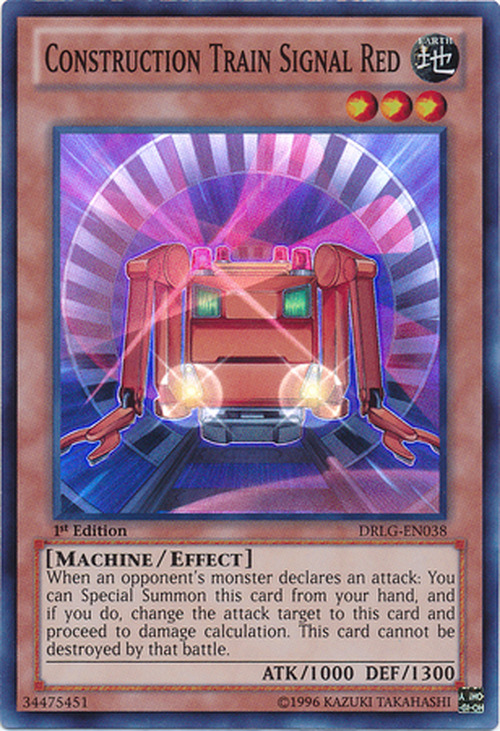 When your opponent's monster declares an attack: You can Special Summon this card from your hand, and if you do, change the attack target to this card and proceed to damage calculation. This card cannot be destroyed by that battle. On railroads, a red signal is used to tell the engine to stop. In this case, the opponent's monster is forced to stop its attack on another target, and now this card is the target. This monster is a set of buffers, which are used on railways to stop trains from going on past the end of a track. This monster appears in the artwork of Revolving Switchyard.